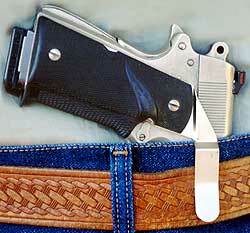 I have seen a recent trend in off-duty and concealed firearms carry that strikes me as dangerous. The proliferation of smaller, more powerful handguns has spurred a wave of creative carry ideas that are potentially lethal to the user. I would say these carry methods tend toward the “holsterless” gun. Two examples of this are the carry clip and the pocket wallet. Carrying a handgun without a holster is nothing new. Traveling back to the Old West, you may see revolvers stuck sideways in a belt. Sepia photographs from those days are flush with cowboys, lawmen, and ruffians proudly displaying their guns this way. Massad Ayoob wrote about a holsterless waistband carry method in 19th century Mexico that let the civilian vaquero ditch his handgun, at the approach of the mistrusted Federales, without wearing the incriminating holster and belt. It was called “Mexican Carry” and is not derogatory. 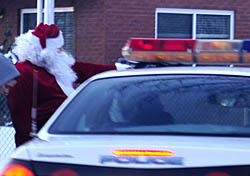 Merry Christmas to all of the deputies, cops and other readers out there. I wish all of you were at home with your loved ones, but I know many of you, like me, are in uniform today. So, stay safe and make sure you go home to your families at the end of the shift. A “riot laser rifle” called the SMU100 is being marketed to police departments in the UK as a non-lethal tool to disrupt looters and violent people from a distance of 500 meters. The manufacturer of the light gun, Photonic Security Systems, previously marketed the SMU100 laser rifle as a maritime security tool to discourage pirates. 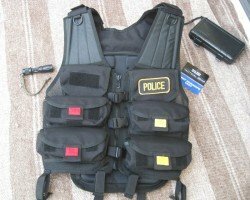 Uncle Mike’s Law Enforcement products has brought out a load-bearing vest alternately called a Breacher’s Vest or Shot Gunner’s Vest that has a dual application for police officers. This vest is build specifically for the officer or operator who needs to take aboard a large payload of shotgun shells. Previously, I told you how I felt about the police shotgun in today’s patrol environment and it was favorable. A shotgun is also a valuable tool in a SWAT situation. The shotgun is undoubtedly the most devastating close quarter weapon that can be wielded by a team member. In some agencies, the shotgun is employed to facilitate door breaching. Below is an excellent training video on youth gangs. The video is a filmed presentation given by Cpl. Mike Rudinski of the Hyattsville (MD) Police Department. The video is more than one hour long. This training video is worth watching if you deal with youth and/or gangs at all. This isn’t the typical “Bloods wear red” kind of video. There is some very good information on how crime in schools is worsened by No Child Left Behind, why gangs will send fresh blood into a school, how non-LEO staff should respond to strangers on campus and more. I just received a Spyderco Yojimbo 2. If you’ll remember, I was able to scoop this product and get an exclusive video interview with designer Mike Janich at SHOT Show 2011 back in January. Of course, I instantly like Yojimbo 2. It has an aggressively profiled blade, good ergonomics in the G10 handles, and a nice heft for a defensive folder. It is very ruggedly constructed. 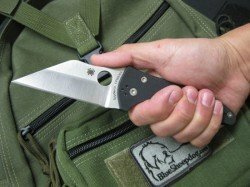 I swapped the polished steel pocketclip for a black one from a Spyderco Delica 4. The clip holes are drilled to the same dimensions, but the Yojimbo 2 has English standard threaded screws, while the Delica screws have metric threading. Keep the same screws. 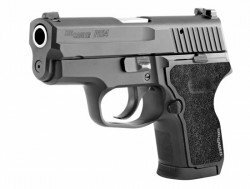 Over at GunsHolstersAndGear.com, I wrote about a new compact pistol SIG SAUER is releasing called the P224. The P224 is a cut down (literally – take a look at the photos over there) P229 and is chambered in 9mm, .357 SIG and .40 S&W. Initially, the new gun will come with the DAK trigger, which has a very smooth double action only pull. SIG states a DA/SA pistol will be available later. The gun should be at the 2012 SHOT Show, and we will get some video and more information on it then.